AlbertaSat’s students at the Canadian SmallSat Symposium. left to right: Chris Robson, Callie Lissinna, Katelyn Ball, Tyler Hrynyk and Associate Professor Carlos Lange. Credit: AlbertaSat. To understand how AlbertaSat came to be, what the group has accomplished, what it’s doing now and where it’s headed, I spoke with two of its nearly 50 members, neither of which was part of the original team. Callie Lissinna is the Deputy Project Manager and Logan Fairgrieve-Park is the Science Team Lead and the Attitude Determination and Control System Team Lead. Continuity, that’s one of the positive outcomes of the original group. It wasn’t just about the students designing and developing a CubeSat. It was also about making sure knowledge learned and skillsets were passed on to new students as they joined the group. AlbertaSat isn’t just for engineers and scientists. 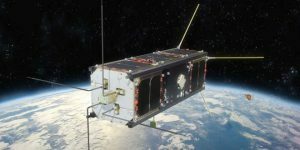 The Canadian Satellite Design Challenge, the Canada wide competition which inspired them and which they participate in, encourages university students from different study areas to form teams to develop and build a nanosatellite, or CubeSat. Students from other disciplines take part as well, as the project needs to have marketing, communication, financial and project management skills. The AlbertaSat students are also guided by faculty members, including Professor’s Ian Mann, Duncan Elliott and Associate Professor Carlos Lange. Communication, or outreach, has been an important part of the groups focus. Inspiring students younger themselves to consider careers in science, technology, engineering, and mathematics (STEM) and other fields that are needed for the space program is something they have actively worked on. In the past year alone, they figure they’ve given 20 talks including participating in several events in Alberta. AlbertSat isn’t the only student group leading the way in Canada. Over a dozen universities have participated in the Canadian Satellite Design Challenge and several have worked together to create new groups and projectd including the Montreal Student Space Associations. Listen to the podcast to learn more and hear from the students themselves.